Is 10 minutes of your time worth discovering new ways to keep your own money? We think so. Just submit the info below and we'll email your eBook right away. 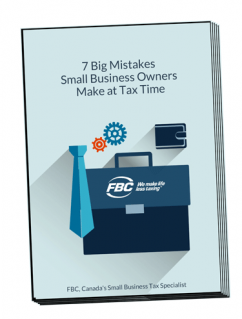 As a small business owner, you don't have time to be a tax expert, too. Avoid these 7 mistakes. Building your business and serving your customers is hard. It's easy to rush and mistakenly complicate your tax situation. In any tax assessment, CRA is right and you are wrong -- unless your records and bookkeeping prove otherwise. Avoiding these 7 mistakes will help you prepare an accurate and complete tax return. Help you ensure you receive all the credits and grants you're entitled to. And, avoid unnecessary CRA audits. Would you like to receive future emails with more tax, accounting and money-saving tips? "As a busy person, the combination of the high level of knowledge and the personal on-site approach saves me both time and money. FBC assists in minimizing my taxes through their Early Tax Call program. This program results in finding opportunities to reduce my tax bill over time." "I’ve been in business for 9 years and this is the first time I’ve felt confident in my return knowing it’s right, it’s guaranteed and everyone I’ve spoken to at FBC has been 100% professional and perfect to deal with. "